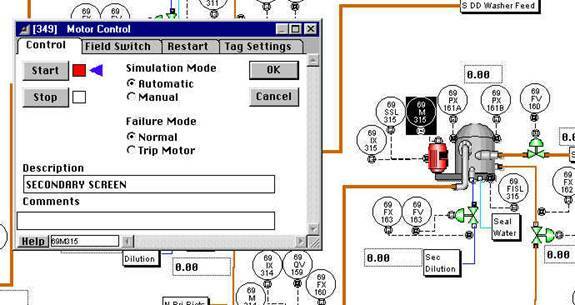 When a simulator is used for staging of the control system, it is an excellent tool for ‘debugging’ the control system logic. This saves a tremendous amount of time during startup. ‘Hi-fidelity’ simulations can point out design deficiencies that simple steady state models miss. This can also save a significant amount of time and money during startup. Dynamic process simulators vary according to fidelity and suitability to task. Low fidelity simulators can be used effectively to check out control system logic and train operators who are already familiar with the process but unfamiliar with the control system. 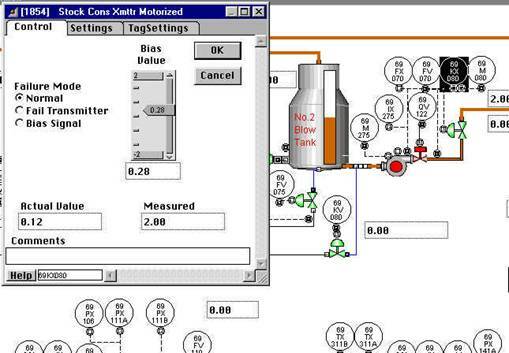 Medium fidelity simulators provide a more robust control logic check out, better training for operators unfamiliar with the process, and basic process design verification. Hi-fidelity simulators are needed when the process is new to the operators and more advanced process design verification is desired. 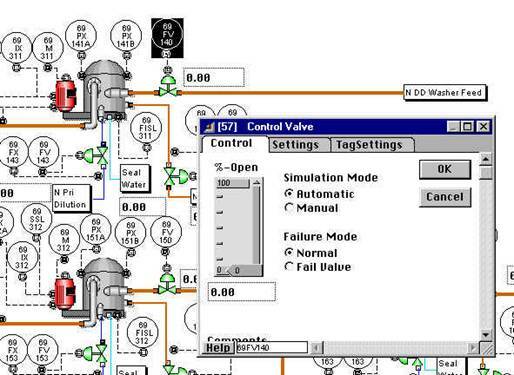 Process Automation & Simulation Services (PASS), Inc. strongly believes in providing our clients with cost-effective dynamic simulators that meet the needs of the project - not force-fitting a single approach. Our engineers have a combined 16 years experience in developing a full range of simulators. In the past, when appropriate, we have built low, medium and even high fidelity simulators within control systems. For our most recent projects that required hi-fidelity simulation, we developed Simplicity, a PC-based, object-oriented tool. 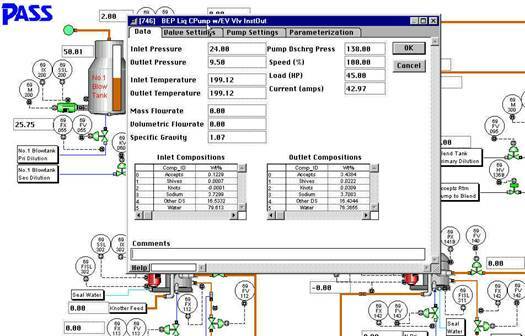 Simplicity provides realistic, ‘hi-fidelity’ dynamic process simulation utilizing actual equipment design data, pump curves, valve sizing coefficients, system hydraulics, heat and material balances, thermodynamics and empirical data. Simplicity uses graphic representations of process objects so building a dynamic simulator is easy and intuitive – almost like creating a P&ID. Simplicity is also extensible, so new process objects can be added as required. Using Simplicity, it is easy for the trainer to create equipment faults or process upsets that test the operator’s ability to respond to abnormal conditions. 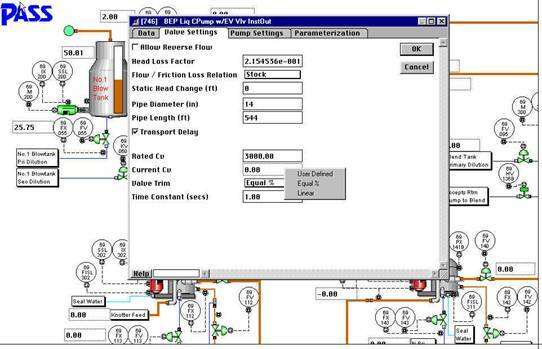 Model maintenance is also a snap – changing pumps, valve sizes, equipment characteristics is as easy as double clicking on the object and entering the new information in the parameter pop-up window. Dynamic simulators built with Simplicity are interfaced to the actual control system. The advantage to this approach is threefold: reduced development costs, improved operator training, and ease of simulator maintenance. The development costs of this approach are lower because only the process is simulated; no time or money is wasted on emulating the control system. Operator training is enhanced since they are trained on the actual graphics, control logic and system hardware – not an emulation of their system. 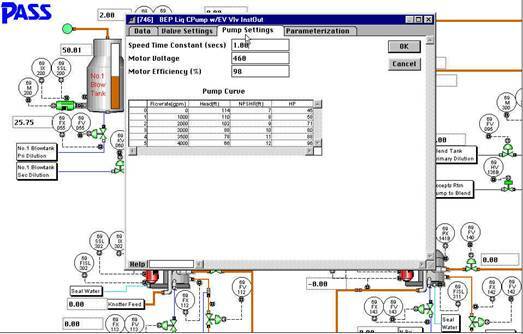 Finally, updating the simulation system for graphic or logic changes is almost automatic since the system uses the exact same graphics and control logic programming of the actual system. 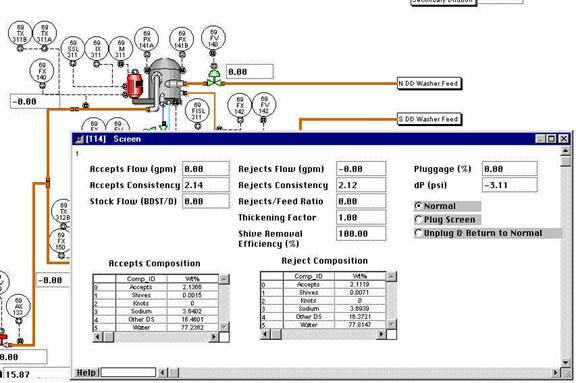 Pump Curve Data for a Combination Pump/Control Valve/Pipe Object. 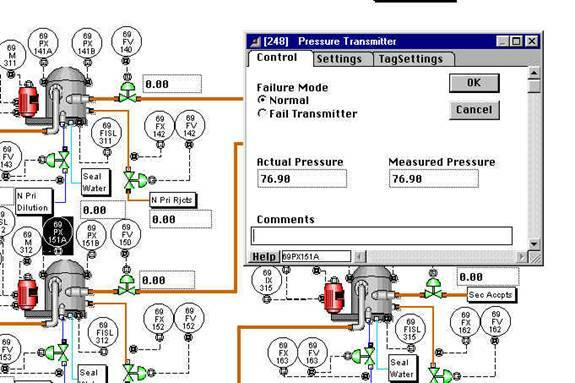 PASS dynamic process simulators have proven their value on project after project. The contribution of a PASS simulator to a project was highlighted in the December ’97 PAPERMAKER article on Boise Cascade’s very successful J-3 paper machine startup. 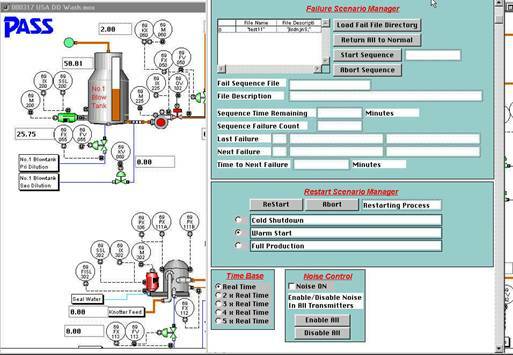 PASS also created the simulator for the new Mead Containerboard (Stevenson, AL) recovery boiler and chemical conversion processes. The Ahlstrom sulfite chemical conversion process is the only one of its kind in the United States and the simulator was instrumental in training the operators on its proper startup and operation. PASS provided operator training was an integral part of each of the above projects.